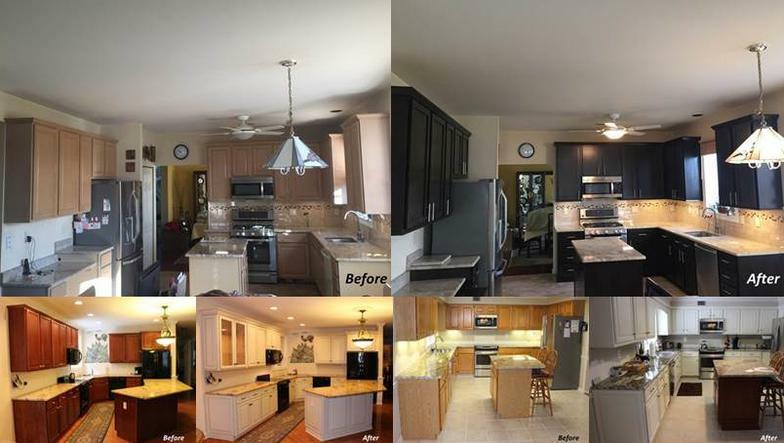 Looking to update your kitchen without the high cost and inconvenience associated with a kitchen remodel? Cabinet refacing is the perfect solution to give you the kitchen of your dreams for half the price and a fraction of the time. ~ Choose new solid wood doors and drawer fronts in a variation of styles, finishes and wood species. ~ Choose new decorstive mouldings and hardware to complete your kitchen. ~ An extensive selection of accessories is also available to further customize your cabinets, such as: pull out shelves, lazy susans, tray dividers, waste/recycling bins, drawer inserts, and much more. ~ Additional cabinetry may be added. ~ Detailed measurements of your kitchen are taken by a cabinet specialist. ~ Each project is completed by our employees- NO subcontractors! ~ Our certified installers will transform your existing cabinets within 2-3days.